With the proliferation of the 500 series platform, here’s a new way to rack mount three individual modules in a single rack space for recording and live use – the A-Designs 503HR. It has a robust external power supply with an LED display to indicate the amount of power being consumed. A three-LED array on the face plate displays the +16V, -16V and +48V. you to just feed 1 and 2, or indeed none. The “Feed” switch is a 3-position switch used for: Slots 1 and 2 or “Off” or “All”. This reduces the need to use six XLR cables for a channel strip – but, if you want to do so, you still have that option available. 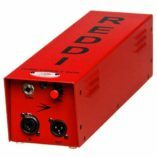 When using the 503 with the “Feed” switch, all that is needed are two XLR cables – male and female. 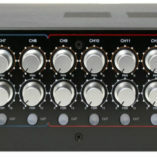 As an example, the input would go to Slot 1 and the output to Slot 3, when the “Feed” switch is in the “ALL” position. 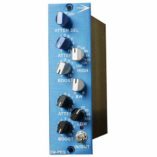 In addition to being the perfect companion for A Designs Audio 500 series modules, the 503HR is compatible with most VPR Alliance modules, and is an affordable solution for any trio of 500 series processors. Compatible with all A-Designs 500-series modules. Will accept API 500-Series modules and other VPR compliant modules. Please check with the manufacturer. Four basic modes of operation with various A-Designs modules. Internal highly stable regulated power supply with +48V phantom power. 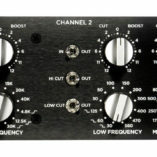 2 x 2 balanced XLR I/O. Power requirements are 100/120/230 VAC – 14W. DC power output per channel is 140mA @ 16VDC.